All the T-mount lenses have a pre-set control of the diaphragm aperture. These lenses have a screw mount with a male M42x0.75 thread. An adapter ring, called T (made in one piece) or T2 (made in two pieces), allows to fit these lenses on all 35mm SLR cameras. 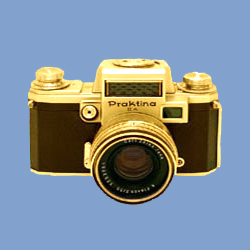 For the Praktina is not available the adapter type T2. The T-mount lenses were manufactured as from 1962 by a small numbers of Japanese makers and marketed with an incredible number of different brand names as Accura, Aetna-Coligon, Aetna-Rokunar, Albinar, Amitar, Asanuma, Astranar, Bass, Bell & Howell, Berolina, Bower, Bushnell, Cambron, Carsen, Caspeco, Centon, Century, Enna, Hanimar, Hanimex, Juplen, Kaligar, Kalimar, Kawanon, Kenko, Lentar, Marexar, Ohnar, Optomax, Palinar, Paragon, Perkin-Elmer, Photax, Phoenix, Plixor, Prinz, Prinxgalaxy, Promaster, Quantaray, QuarryMaster, Rokinon, Rokunar, Sear, Sigma, Samigon, Sears, Seikanon, Seriese, Sima, Soligor, Sonnagar, Spectra-Coligon, Spiratone, Sun, Sunset, Tamron, Tokina, Unistar, Vemar, Vivitar and others. The YS mount adapters have the identical specification as T mount adapters so that a T adapter may be used to fit the YS lenses on Praktina. Naturally, with T adapter the operation of YS lenses would be non-automatic. The YS mount was used on some Sigma, Sun, Suntar, Accura and Spiratone lenses along with a few other brands.